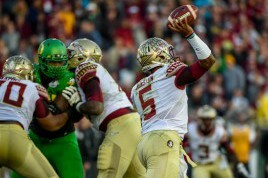 Before Oregon faced Florida State in the Rose Bowl, there was a lot of talk about Marcus Mariota vs Jameis Winston. This echoed the debate early in the year in reference to the Heisman Trophy. Now yet again, these two players are part of the same conversation – this time in leading up to the NFL Combine and eventually the draft. Much like Robert Griffin III and Andrew Luck, or Ryan Leaf and Peyton Manning before them, Mariota and Winston will probably be tied together and compared to one another for a long time to come. The questions on everyone’s minds now: who will be No. 1, who should be No. 1, and which one is the better QB? 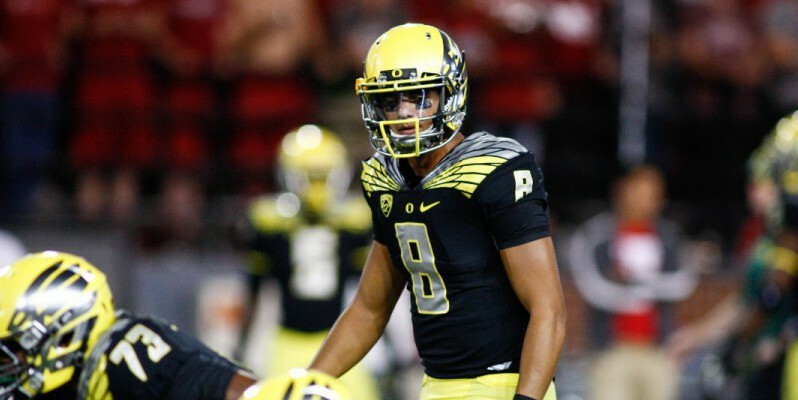 Mariota prefers to throw on the run and operate from outside the pocket. Looking at their strengths and weaknesses, you can see how it is hard to compare them because they play very different games. While Mariota’s game is at its best when he can make quick reads and progressions, Winston’s style is a game of taking advantage of what a defense leaves open once they adjust. Mariota also prefers to roll out and find open receivers if his initial receiver isn’t there, much like the way Russell Wilson does in the NFL. Winston, on the other hand, loves to stand in the pocket until the last second before he’ll roll out. Winston likes to stay in the pocket and let his O-Line protect him. Some speculate Winston’s play style is the more pro-ready style. He played from under center a lot during his college career, standing in the pocket and reading the defense to find an open receiver. If this were 10 years ago I’d have to agree with this assessment; however, with the sorts of offenses that have become popular of late, suddenly Winston and Mariota seem on more equal footing. On top of this, there are also the character and off the field issues that have been so well documented with Winston casting doubt on how he will be as a professional. Where Mariota excels the most is in the intangibles and off the field categories, being widely known as a good, professional kid who always does the right thing (aside from that one speeding ticket). This gives an interesting duality to Mariota, as he is seen as both the riskier pick because of playing in, what is seen as a very un-NFL style offense, yet he is also the safe pick because you know he isn’t going to get in trouble. This means if Mariota can dispel his biggest question marks (being able to take an under center snap, 3, 5, and 7 step drops, etc.) at the combine and his pro day then he suddenly becomes the obvious first pick. 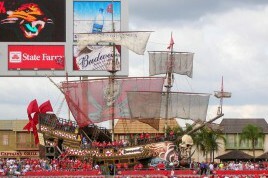 Who does Lovie trust to captain the ship? For the Tampa Bay Buccaneers, it will come down to one main thing in deciding who they’ll take with the first overall pick; who do you trust? Do they trust Mariota to adapt to the NFL game and to be able to adjust to working more from under center, dropping back, etc. And of course with Winston, the question is do they trust him to be the face of the franchise, and to have the kind of money he’ll have and not get in trouble off the field. My best guess? I think they end up going with Mariota unless Winston dazzles them in face-to-face interviews. Tampa’s coach Lovie Smith is a former assistant to Tony Dungy and both of them are known for prizing players with character and discipline above all else, and if that holds true then Mariota should be his man. Both of these QBs are great players, and barring off the field issues or injury I think they will both succeed in the NFL. 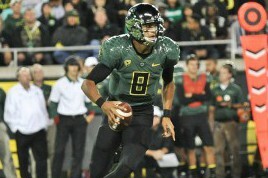 But, speaking both objectively and as a Ducks fan, Mariota has a much higher upside the Winston and is a more versatile player. All of the concerns people keep throwing out about taking under center snaps are overblown, as I’m concerned. The idea that Mariota will be unable to figure out how to take a handoff between the legs of his center is just ridiculous. So, while both of them will likely be successful, I’ll put my money on our Skinny Hawaiian in the NFL.